A SECRET: This GUI was written in FreeBASIC. Fun500 GUI 3.0 is a definite breakthrough in progress for this once simple GUI. 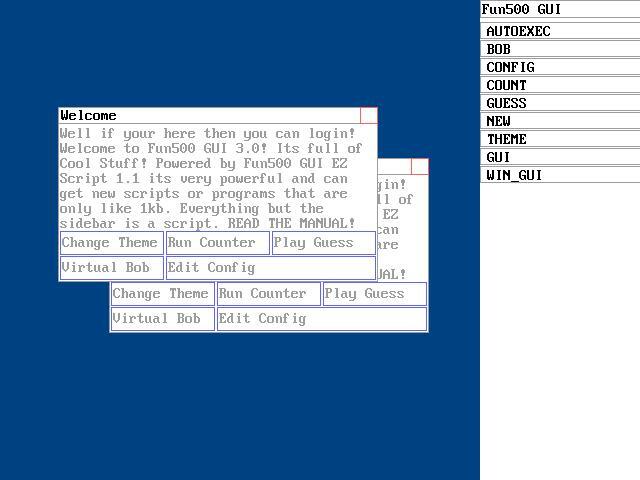 The major feature in Fun500 GUI 3.0 is the new scripting engine which provides users with a way to write programs for Fun500 GUI and to "multitask" between programs. The scripting language is very simple and can be somewhat too simple, but the language is easy enough to learn. There are documentation and example scripts so you're not left in the programming dust. The scripting language resembles a very elementary language similar to Assembly. There are a few problems with windowing. Whenever you drag a window, you sometimes lose the window or the window will underlay itself if dragged near other windows. There is also no outline to show you where the window will appear once released from dragging. There are really only a few GUI widgets in the system: label, button, window, text box. An example is when running the "THEME" program, you must type in the theme instead of selecting the theme. Other than that, the GUI runs well and strong.